At this time of year Singapore is extremely hot and humid, even during the night. Temperatures were still hovering around the 30C mark come the race on Sunday and rain was even a significant threat. Whilst the rain held off, teams were forced to open up the bodywork a bit more to cool the cars on a track where they get little chance to breathe – 23 corners are separated by only three proper straights. Singapore also marked the return of the high downforce packages as the Spa/Monza aero will probably be stored away getting dusty for the rest of the year. There were no large developments but an array of smaller, detailed components made their way onto the cars as the F1 circus heads into a packed final five races. First of all I’d like to discuss Nico Rosberg’s electrical problem that eventually caused his retirement. According to Mercedes, the wiring loom in the steering column – that links the steering wheel functions to the rest of the car – was faulty and therefore was sending incorrect information. You could see that the clutch operation was inconsistent and although he had information on his central display on the steering wheel, it was often false. He was also double upshifting on occasion despite only pulling the paddle once, which made drive out of corners incredibly slow. Couple this to the fact that he didn’t have DRS in operation and he was always likely to call it a day early. This corrosion could have occurred overnight whilst the cars were in parc ferme. However there has been recent word that – because of the unusual failure of this loom given its relative lack of stress compared to other looms along the car – the problem might not be related to corrosion of wiring at all. The likelihood of such a failure is so unlikely that it prompted comments from an electrical engineer in F1, suggesting suspicious behaviour. Although there is no direct quote, he/she was under the belief that the problems were caused by a different engine mapping setting. If the map was run incorrectly (i.e. not finalised) this could relay conflicting information to the steering wheel’s computer and the car’s ECU, thus creating problems. This comes a day after Mercedes were under serious threat for pole position and Lewis Hamilton then winning the race at a canter. It doesn’t really add up, suggesting to me that Mercedes could have potentially turned up their PU settings to seek an advantage. It is common knowledge that the team have not been running at maximum settings all year, so it’s certainly plausible. Aside from technical problems, an actual technical development came in the form of new gear ratios in the W05. Mercedes chose to play their ‘joker’ card for the year, despite the fact that their longer gear ratios have been identified as one of their keys to success in 2014. However after the Belgian GP, the team noticed that they were losing out to others out of higher geared acceleration zones, such as the top of Eau Rouge, prompting the recent change. The ratios they introduced in Singapore are very different – much shorter. It puts them line with Red Bull but they are not quite as short as Williams. To break it down further, 1st gear remains the same (as far as I am aware), whereas 2nd and 3rd have been shortened slightly. 4th is actually slightly longer than the previous ratio and 5th remains identical. 6th, 7th and 8th have been massively shortened, to the point where the new 8th gear is shorter than the old 7th. It’s clear that they have concentrated on the higher ratios after their discovery in Spa, so they should see some benefits at Suzuka next week. The monkey seat winglet above the exhaust was also tweaked. The upper vane element has now been split into two to redirect the exhaust plume beneath – the plume will now rise to the rear wing at a slightly later stage, which should aid airflow attachment at high speed. The main section of the winglet also featured more Zircotec coating and Titanium to resist the heat from the exhaust. More work was done to the rear of the MP4-29 to extract more rear downforce, this time their efforts were focused on the interaction between the mushroom suspension fairings and the diffuser. The mushrooms were reprofiled at the joining point on the rear crash structure, improving airflow along the centre of the car. The small flap above (and just behind) the diffuser was also raised a little higher to move it closer to the lower fairing. These changes should generate a more efficient upwash effect at the rear of the car. A substantial upgrade was evident on the Force India this weekend as the team aim to turn around their qualifying pace deficit to McLaren as the battle for fifth continues to hot up. 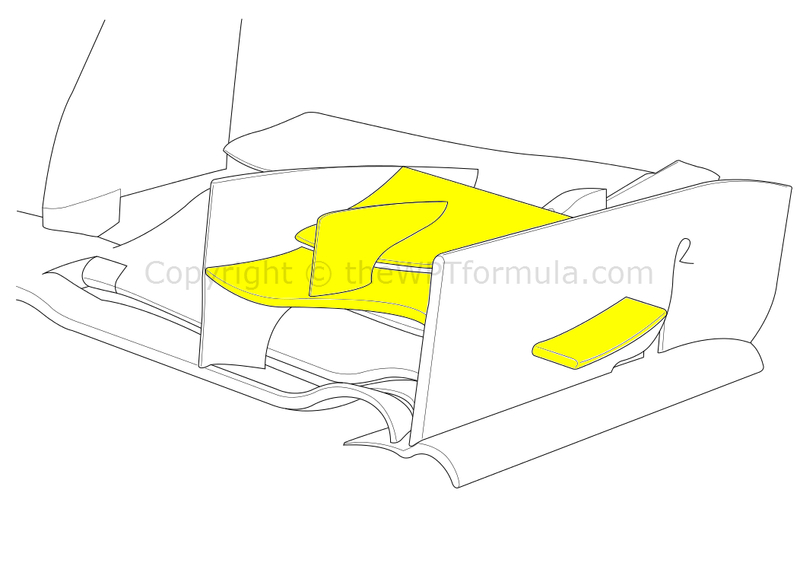 Major changes were made to the front wing endplates, ditching their unique triple-element turning vanes for a single fence (red circle). 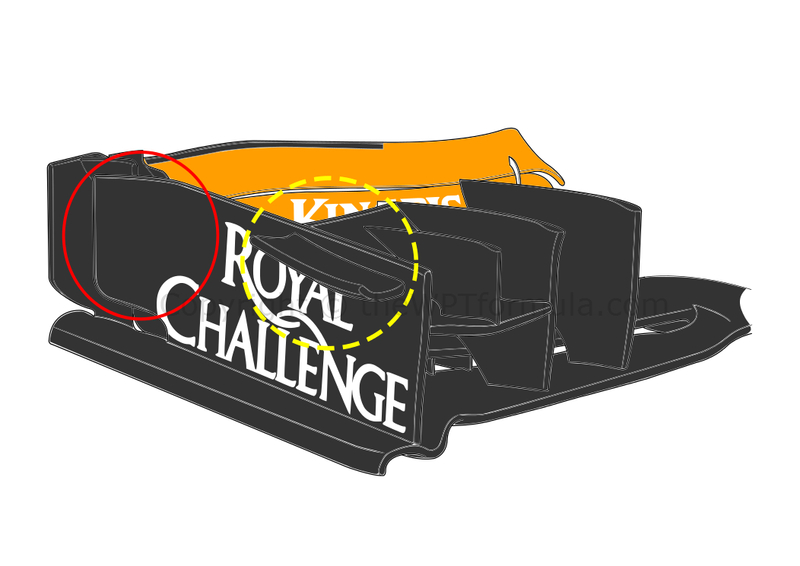 Combined with the lipped pressure gradient vane (dotted yellow circle), the changes should help extract air from the inside of the wing more readily to produce more front downforce. This also has a positive effect on airflow management around the front tyre, as the faster flow of air should hold back tyre wake a bit better. There were also some Red Bull-inspired changes to the rear diffuser, with the vertical hanging vanes split into two and the outer walls extended to their maximum permitted area. The two changes will help push airflow outwards as well as upwards. Combined with the tweaks up front, the VJM07 should have better global downforce. Small tweaks to the RB10 were aimed at drawing Red Bull ahead of Mercedes in Singapore, although this never materialised. The front wing’s upper flap was enlarged to induce slightly more downforce, as well as help condition the Y250 vortex. This was accompanied with a much larger bulge beneath the nose, encouraging airflow towards the splitter region and thus onto the diffuser to generate more rear downforce. Another team to bring significant updates were Sauber. Like Force India, the pressure gradient vane on the front wing endplate received some attention as it is now much longer than the previous design. The sidepods on the C33 were enlarged at the rear to cope with the higher temperatures, although they still exit ahead of the rear suspension elements despite the general trend of passing them through the wishbones/pullrod/driveshaft this year. Finally, the monkey seat winglet at the rear of the car had its Gurney tab removed completely. This is contrary to what we would normally perceive to be a higher downforce update, but by removing the tab the exhaust plume is allowed to rise further back and keep airflow attached to the rear wing for longer. Apologies for the lack of drawings but I’ve been pretty busy lately – just moved into my house in Swansea and university life is a little different, especially this week… You know what I mean! This entry was posted in 2014 Highlights, Technical Highlights and tagged analysis, change, developments, endplate, f1, fault, force, gear, gp, highlights, india, loom, mercedes, nico, ratio, rosberg, singapore, tech, wiring on September 24, 2014 by thewptformula.